My name is Jason Torchinsky, and I am the person that lives under Jason Torchinsky’s Hair. In many ways, I am the person responsible for that hair, which is why I am humbly and solemnly approaching you today. 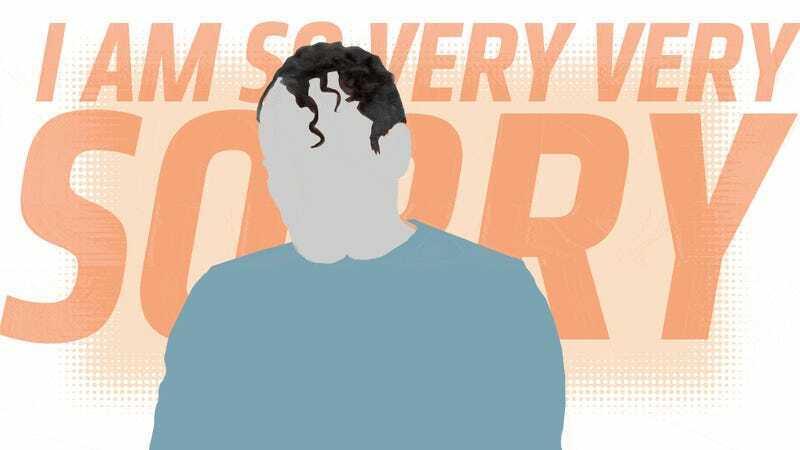 Recent events have brought attention to the issue of my hair and the pain and suffering it has caused people, innocent people, and I would like to attempt to address this issue head-on, before anyone else gets hurt. I will begin by simply saying this: I’m so sorry. While many would argue that my hair has been an issue for quite some time, perhaps stretching back decades, what brought the situation to a head was a recent video we produced here at Jalopnik, an in-depth look into the technical design and details of three popular electric cars. While the video generated many, many relevant comments about the intended subject matter on YouTube, our website, and via other outlets, I can’t ignore the fact that a significant percentage of the comments were referencing my hair, specifically citing the confusion, revulsion, and rage that it inspired. As you can see, this isn’t just one disgruntled person taking issue with hair. This is a movement, a ground-swelling of people who have been pushed too far by that hair, people who have bravely decided that enough is enough, and they must speak out against the weird hair, calling it out, vowing to let the world know that it’s revolting, distracting, and, in at least one case, seems to have assaulted a person. I’m going to link the video here so you, if you choose, can see the hair in question, in full video. Please be aware that this video contains hair that many people have found to inspire feelings of disgust and rage, and has made people deeply uncomfortable. Some reports suggest that exposure to viewing this hair has caused a puppy to become very sick and die; others suggest that any contemplation of the hair and its mysteries can push a human mind to the brink of madness, quaking in fear, rage, and a certain sort of deep, existential dread that the human scalp should be capable of such nightmares. I’m assuming you’ve just finished ejecting the contents of your stomach into a bucket clenched between your knees, and I sincerely hope you’re feeling better. Now that you understand the scope of the hair problem, I hope you’ll allow me this chance to convey my sincere and heartfelt apologies, and perhaps we can all find a way to overcome this crippling problem. While I’m not here to defend my hair, I do feel a bit of explanation is in order. First, I never planned to grow hair that made so many people so unhappy. My hair is, by its very nature, curly, and if left on its own will grow into the sort of phone-cord spirals you see flopping on my head there. My hairline is high, and receding, thanks to the cruel pummeling of age, which has also provided me with a yarmulke-sized bald spot on the crown of my head. These are my burdens to bear, mine alone, and I seek no sympathy regarding my pattern baldness, nor do I offer this up as an excuse for the hell I’ve subjected the world to. My haircut several weeks prior to the shooting of this video was provided by my wife, but the result is not her fault at all. It was I, all by myself, that suggested the idea of keeping some of the top longer than normal, in a woefully misguided attempt to mix things up a bit, because why not. I now realize that this decision was the haircutting equivalent of a war crime. There is no one else to blame in this situation but myself. I grew the hair, converting a portion of the food I consumed into a combination of energy and a protein called keratin, which I then forced out of my ovoid hair follicles in long, dark, coiling strands that lay unevenly and sickeningly on my head, where they could contemplate the harm they’d soon cause to thousands and thousands of innocent internet users. It was I who declined opportunities to cut or restyle the hair, even though I had ample access to mirrors, pools of stagnant urine, and other reflective surfaces in which I could have clearly seen the hellish nightmare hairscape growing on my head. While none of these options are good, in the strictest sense, they do suggest that perhaps something could have been done to try to have made the hair problem less horrific and damaging. There is no way I can ever give back those people who saw my hair the sense of happiness and well-being they had before the fateful moment those dark, cruel squiggles destroyed their innocent notions that the universe was still a benevolent place. I can’t cleanse the memory of my miserable shaggy-yet-scraggly head from their minds, I can’t resurrect their dead sense of hope for humankind that my hair murdered. All I can do is thank them. Thank those people who were brave enough to watch an internet video about electric cars, note that one of the hosts in the video had weird hair, and speak out. It would have been easy to just remain silent, to pretend like that hair didn’t matter, to just try and endure until it went away. Thankfully, though, there are still those people with enough backbone, enough sense of right and wrong, to step forward and call out an injustice when they see it. Thanks to these brave people, the world’s complacency has been shattered, and while that hurts, it’s infinitely better than just trying to pretend that my awful hair isn’t out there, casting a looming, twisty shadow of doom over humanity. I have been informed that my hair has been placed on a thirty-day unpaid leave, which will hopefully give us time to address the situation without having to deal with the hair. Now we can take action. Now, perhaps, something can finally be done. The healing can begin, and perhaps humanity can begin anew, stronger, ready to face head-on the existential challenge that my terrible hair provides. Any action except shaving my head or cutting my hair really short, I mean. I made a childhood promise to the late funnyman Slappy White that prevents me from taking any sort of action like that. Sorry. But don’t worry. Together, we’ll get through this long national nightmare.